Interstate 380 forms a long freeway spur leading northwest from I-80 as part of the multi-state Avenue of the Saints corridor (Iowa 27). I-380 joins the cities of Iowa City, Cedar Rapids and Iowa City in east central Iowa. Coupled with U.S. 218 & Iowa 27, the interstate forms a seamless expressway route south to Mount Pleasant, the Keukuk area and ultimately St. Louis, Missouri. A full cloverleaf interchange joins Interstate 80 with U.S. 218 & Iowa 27 (Avenue of the Saints) on the western outskirts of Iowa City. Interstate 380 begins there, with the trio leading north by the growing suburb of North Liberty to cross Coralville Lake (Iowa River). 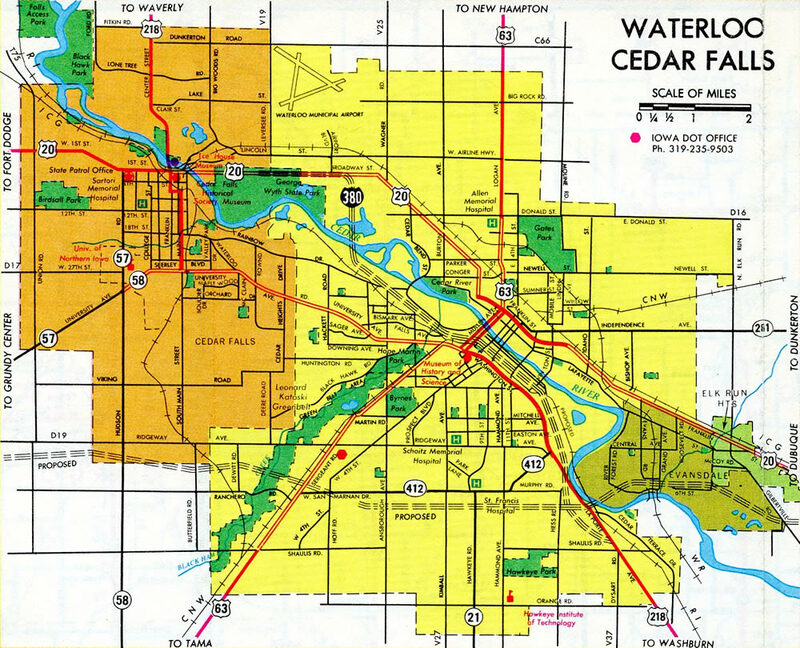 A rural stretch ensues northward to the Linn County line, where industrial parks appear through the south side of Cedar Rapids. Advancing north from central Cedar Rapids, I-380 & IA 27 remain a busy route to the city of Hiawatha north of Iowa 100 to leave the main built up area beyond Robins. 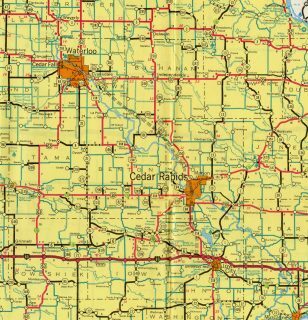 The freeway becomes rural again to Center Point, a bedroom community in northern Linn County, and the ensuing drive through Benton and Buchanan Counties. Interstate 380 & Iowa 27 combine with the U.S. 20 freeway east of Raymond and Evansdale as they enter the Waterloo area. The trio run concurrently for approximately 5.7 miles to a split just west of the Cedar River. Iowa 27 and the Avenue of the Saints corridor remain west along U.S. 20 to Iowa 58 to bypass central Waterloo while U.S. 218 returns to overlap with Interstate 380 for the final two mile spur into the city. I-380 formally ends at the at-grade intersection of U.S. 218 (Washington Street) and Mitchell Avenue. U.S. 218 extends northward from the I-380 terminus along a divided boulevard to a separate freeway linking Downtown with Cedar Falls (and the Avenue of the Saints corridor) to the northwest. There are no plans to join these two sections of highway presently, though ample right of way exists between Hawthorne Avenue and the freeway beginning at 6th Street. Interstate 380 was established by AASHTO from I-80 north to Waterloo via Cedar Rapids on June 23, 1969. It appears the number 380 was selected instead of 180 to offset duplication with Iowa 180, a former state route linking Hayesville with Iowa 149 in Keokuk County. Northbound U.S. 218 transitions directly onto Interstate 380 north at the cloverstack interchange with U.S. 20 & Iowa 27 (Avenue of the Saints). Note the milepost is for U.S. 218, while the exit numbers correspond with Interstate 380. Photo taken by Jeff Morrison (07/25/07). A pair of Interstate 380 ends 1/2 mile signs are posted at the San Marnan Drive underpass in Waterloo. These signs were among the first in Iowa to feature Clearview, which was used by IowaDOT starting in 2006. Photo taken by Jeff Morrison (11/20/06). Tenth-mile markers were placed in the median of freeways and expressways in the Waterloo area in fall 2004 (these were replaced by 2012). This was the last one for Interstate 380. Photo taken by Jeff Morrison (11/20/06). U.S. 218 transitions into an at-grade boulevard from Mitchell Avenue north. Motorists advancing northward encounter another four traffic lights before U.S. 218 upgrades back into a freeway beyond West 9th Street. Photo taken 05/08/10. U.S. 218 transitions form Washington Street into Interstate 380 south beyond Mitchell Avenue. A diamond interchange (Exit 72) follows with San Marnan Avenue. Photos taken by Jeff Morrison (07/25/07). Exit 72 departs for San Marnan Drive and Crossroads Mall as I-380 & U.S. 218 prepare to split at the forthcoming U.S. 20 freeway. Photos taken by Jason Hancock (07/25/07). A single lane flyover carries the Interstate 380 southbound mainline onto U.S. 20 east & Iowa 27 (Avenue of the Saints) south for a 5.7 mile overlap. Photo taken by Jeff Morrison (07/25/07). Replaced guide signs along Interstate 380 & U.S. 218 south at San Marnan Drive. Replacement signs added Iowa 27 for the Avenue of the Saints corridor which bypasses Waterloo via Iowa 58 and U.S. 20. Photo taken by Jason Hancock (03/01). San Marnan Drive constitutes a commercial arterial east parallel to U.S. 20 and north to Crossroads Mall and Interstate 380 & U.S. 218. I-380 ends 0.6 miles to the north but is not acknowledged on San Marnan Drive here. Photo taken by Jeff Morrison (07/25/07). U.S. 20 travels as a full freeway east from Webster City to Waterloo and Manchester. The US highway approaches Exits 232A/B with Interstate 380 & U.S. 218 north to Downtown and U.S. 218 south to La Porte City. Photo taken by Jeff Morrison (07/25/07). Exit 232A separates from U.S. 20 east at the Hess Road underpass. Signs for I-380 north and U.S. 218 were replaced here by 2012. Photo taken by Jeff Morrison (11/20/06). I-380-U.S. 218 & Iowa 27 (Avenue of the Saints) south traverse open farm land along the western edge of the Coralville city limits to the exchange (Exits 0B/A) with Interstate 80. Photo taken 04/12/13. See Interstate 380 South – Linn & Johnson Counties on AARoads for additional and historical photos from this perspective. U.S. 218 & Iowa 27 (Avenue of the Saints) leaves built up areas of University Heights and Iowa City by a quarry on the two mile rural stretch preceding Interstate 80. Photo taken by Jeff Morrison (03/12/07). Interstate 80 constitutes a busy trucking corridor between Des Moines and the Quad Cities across Iowa. The Capital City lies 101 miles to the west. Photo taken by Jeff Morrison (03/12/07). One quarter mile ahead of the eastbound off-ramp for Interstate 80 to Davenport, Bettendorf and Chicago, Illinois. The freeway east expands to six and eight lanes across the Coralville and Iowa City metropolitan area with four local interchanges. Photo taken by Jeff Morrison (03/12/07). Interstate 380 appears for the first time as northbound motorists along the Avenue of the Saints reach the off-ramp for I-80 east. Heading east, I-80 travels 50.3 miles to the split with Interstate 280 in Davenport. Photo taken by Jeff Morrison (03/12/07). Travelers bound for Des Moines and Omaha loop away from U.S. 218 & Iowa 27 north for I-80 west. The interchange between the two freeways is unnumbered in the northbound direction. Photo taken by Jeff Morrison (03/12/07). Three miles ahead of Interstate 380, U.S. 218 & Iowa 27 (Avenue of the Saints), drivers are given advance notice for the upcoming cloverleaf interchange between the two freeways. I-80 straddles northern reaches of Sand Hill on this stretch preceding both a rest area and the Tiffin exit. Photo taken by Jeff Morrison (09/07/06). Ireland Avenue passes over Interstate 80, one mile west of the U.S. 218 is a rarity: an even-numbered north-south U.S. route. Other north-south even-numbered U.S. routes include U.S. 550 in Colorado and U.S. 220 through the Mid-Atlantic states, including Pennsylvania, Virginia, and North Carolina. Prior to its decommissioning on July 1, 2003, U.S. 666 was another even-numbered north-south route. U.S. 666 is now known as U.S. 491. Photo taken 06/19/15. Exit 239A departs from I-80 east for U.S. 218 & Iowa 27 (Avenue of the Saints) south to Mt. Pleasant, Keokuk and St. Louis. The Iowa 27 designation was assigned in 2001 to provide a single route number for the high priority Avenue of the Saints corridor. 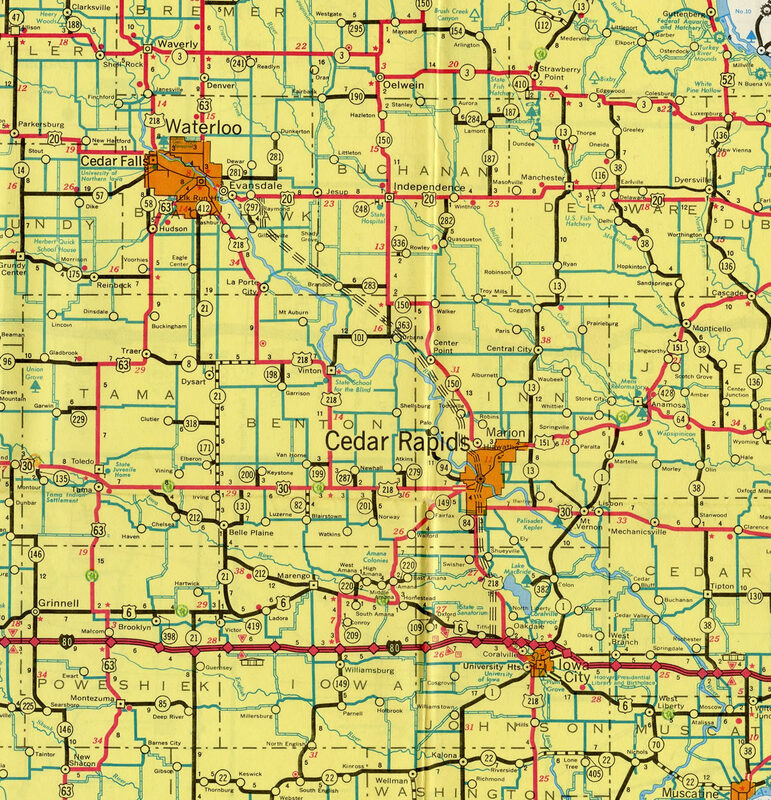 IA 27 overlaps with several other routes across the state, with the exception of the southernmost 18 miles from the Missouri state line to the merge with U.S. 218. Photo taken 06/19/15. A loop ramp takes motorists onto Interstate 380 & U.S. 218-Iowa 27 north to Cedar Rapids and Waterloo. I-380 doubles as a commuter route between Iowa City and Cedar Rapids, with 2014 traffic counts topping out at 55,600 vehicles per day at the Linn County line. Photo taken 06/19/15. Interstate 80 east at Interstate 380 prior to the designation of Iowa 27 for the Avenue of the Saints. Another change in this set of signs was the removal of Iowa 965 for the pre-freeway alignment of U.S. 218 along Coral Ridge Avenue between U.S. 6 and North Liberty to the east. Photo taken by Jason Hancock (02/00). The signs for Exits 239B and 240 were amended to show Iowa 27 north along I-380 and omit Iowa 965 (decommissioned July 1, 2001) for the adjacent interchange by Coral Ridge Mall. 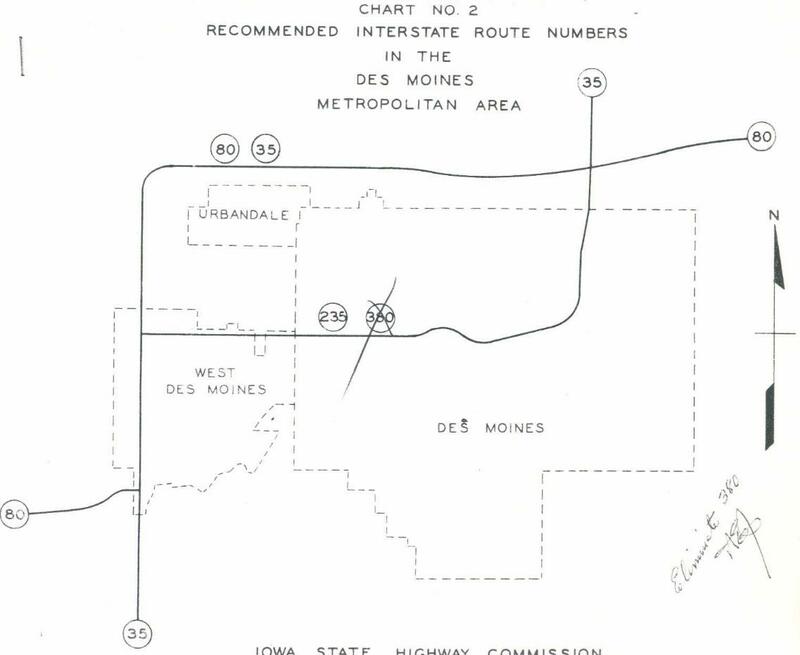 U.S. 218 bypassed Iowa City in 1985 when if shifted to I-380 and the new freeway south from I-80. Photo taken by Jason Hancock (01/06). A nondescript sign stands within the six-ramp parclo interchange with Coral Ridge Avenue (old U.S. 218/IA 965), 1.25 miles ahead of Exits 239B/A with Interstate 380, U.S. 218 & Iowa 27. The greenout here covers two miles. Photo taken 04/13/13. Interstate 80 west expands to four lanes with an auxiliary lane to Exit 239B for I-380 north. These signs were originally installed in November 2003. 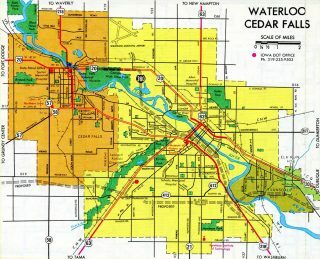 According to Jeff Morrison, for approximately 24 hours, the right sign displayed “Cedar Radids” instead of Cedar Rapids. Additionally the left sign should indicate 1 1/4 miles instead of 1 mile. Photo taken 04/13/13. Interstate 80 west crosses Clear Creek ahead of the off-ramp (Exit 239B) for I-380-U.S. 218 & Iowa 27 north to Cedar Rapids, Waterloo, Mason City and Minneapolis-St. Paul. Photo taken 04/13/13. A loop ramp (Exit 239A) connects westbound Interstate 80 with U.S. 218 & Iowa 27 south to Mount Pleasant. The Avenue of the Saints travels south as a full freeway to Iowa 22 in northern Washington County. Photo taken 04/13/13. Interstate 380 north from Interstate 80 predated the U.S. 218 freeway south by University Heights by 12 years. This view looks at the lone ramp departing westbound for Cedar Rapids. I-380 was open north to U.S. 30 at this time. Photo taken by Michael Summa (1976). “How one city in Iowa caught 160,000 speeders in less than two years.” Star Tribune (Cedar Rapids, IA), May 13, 2015. “Speed cameras still operating in Cedar Rapids.” KWWL (Cedar Rapids, IA), March 2 2016. Page updated March 21, 2016.